2 1055 hp (787 kW) Mitsubishi Ha-102 14-cylinder two-row radial engines, driving constant speed three blade metal propellers. The Ki-46-I used two 870 hp (549 kW) Mitsubishi Ha-26-1 engines. The Ki-46-III was unarmed, used two 1500 hp (1188 kW) Ha-112-II engines, which increased the maximum speed to 391 mph (630 km/h). Increase of the fuel capacity to 500 gallons (1895 liters) increased the range of 2485 miles. The Model Ki-46-III KAI was a night fighter with a crew of 3 armed with two 20mm Ho-5 cannon fixed in the nose and a 37mm Ho-204 firing at 30 degrees from the top of the fuselage. The Ki-46 "Dinah" was an excellent reconnaissance aircraft, capable of flying high and fast. It was exceedingly difficult for Allied aircraft to intercept, and it was highly reliable and popular with its pilots. 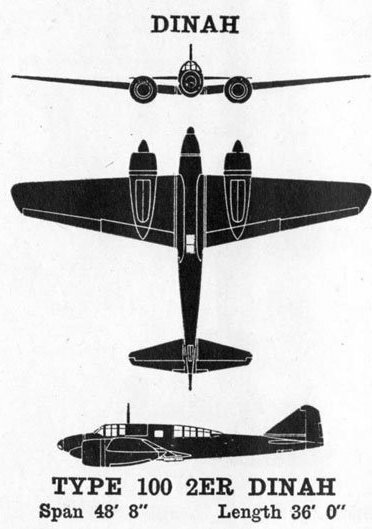 The design went back to 1937, when the Japanese Army began developing specifications for Mitsubishi for a reconnaissance aircraft to replace the Ki-15 "Babs". The new aircraft was to combine high altitude performance to avoid interception with a long range to operate across the vastness of the Japanese Empire. The design team under Kubo Tomio called upon the University of Tokyo to help develop close-fitting cowlings for the engines and fully retractable landing gear. The wings had a thin section and the fuselage was narrow, with a central fuel tank, giving the aircraft some of the finest lines of any aircraft deployed during the war. Extensive wind tunnel tests were carried out to reduce drag to an absolute minimum. As a result, the prototype did not fly until late November 1939. The Army was enthusiastic in spite of the initial failure of the design to meet the speed specification. A switch to the Ha-102 engine solved the performance problem, and the aircraft went into production in March 1941. "Dinahs" carried out unauthorized overflights of Malaya before war broke out, photographing possible landing beaches. A small number were acquired by the Navy, which used them to reconnoiter Darwin from bases on Timor. The Germans were interested in building their own version, but the Japanese demurred on supplying plans. Just as U.S. Army P-38Fs began to inflict serious losses on the "Dinah" squadrons, the Army authorized production of the Ki-46-III with more powerful Ha-112 engines. The new engines and the introduction of a streamlined canopy increased the maximum speed to 404 mph (650 km/h). Range was maintained by adding another fuel tank in front of the pilot for a total of 500 gallons (1895 liters). The new model was once again almost invulnerable to interception, remaining so until the last months of the war, when improved Allied radar and fighter performance and lack of skilled Japanese aircrew caused losses to soar again. Starting in September 1944, a number of Ki-46-IIIs were converted to night fighters, which had the performance to intercept B-29s but were handicapped by a lack of radar.